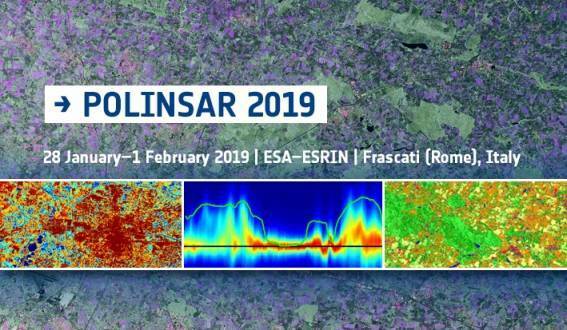 The European Space Agency is organising POLinSAR 2019, the 9th International Workshop on Science and Applications of SAR Polarimetry and Polarimetric Interferometry, to be hosted in ESRIN, Frascati, Italy from 28th January to 1st February 2019. The main objectives are to provide a forum for scientific exchange, present the latest exploitation results obtained from full-pol airborne and spaceborne systems, assess the state-of-the-art, review the techniques to retrieve bio-geophysical parameters and their accuracy, give recommendations for algorithm development and new products, support the preparation of the exploitation of future full-pol missions by ESA and Third Parties (e.g. BIOMASS, NOVASAR-S, RCM, SAOCOM, TerraSAR-L ...), present innovative polarimetric applications and ideas for future polarimetric mission concepts.